Impacting Shasta County and the town of Redding, the Carr Fire has become the sixth most destructive fire in California's history, ripping through more than 125,000 acres and destroying or damaging over 1,500 homes and buildings. Other smaller fires, such as the Ferguson Fire near Yosemite National Park, are also raging in California due to the hot, dry weather. The Red Cross is a scam. Donate to charities that actually give 100% aid to the people that need it. Am I a jerk for wondering why people would live in a home smack in the middle of millions of trees in one of the hottest, driest areas in the country? It hasn't been this bad for a long time... I have lived in California since 1989. There has been a pretty severe drought here in the last decade that has hit the place REALLY hard. Even the place I'm renting right now in the high desert, if you go to Google Maps, you see trees, grass, bushes... in the street view. Now? I have dirt in my front yard, dirt in my backyard - everything has died in the last 10 years. CA has worked hard to require places to create a safe zone around their houses but there always seems to be idiots who love starting fires (getting worse) every year. Thanks to the drought, it's ... really bad here. We're all fined if we use a lot of water too. So I have a bucket in the shower to flush the toilet to help with the water shortage that we've been having here for the last year+. Trillion dollar company donates a whopping $1 million dollars. That’s equivalent of a guy making $50K a year throwing in a nickel. Why give the tax deduction to Apple? Apple does not get a tax deduction for this, you do if you donate. 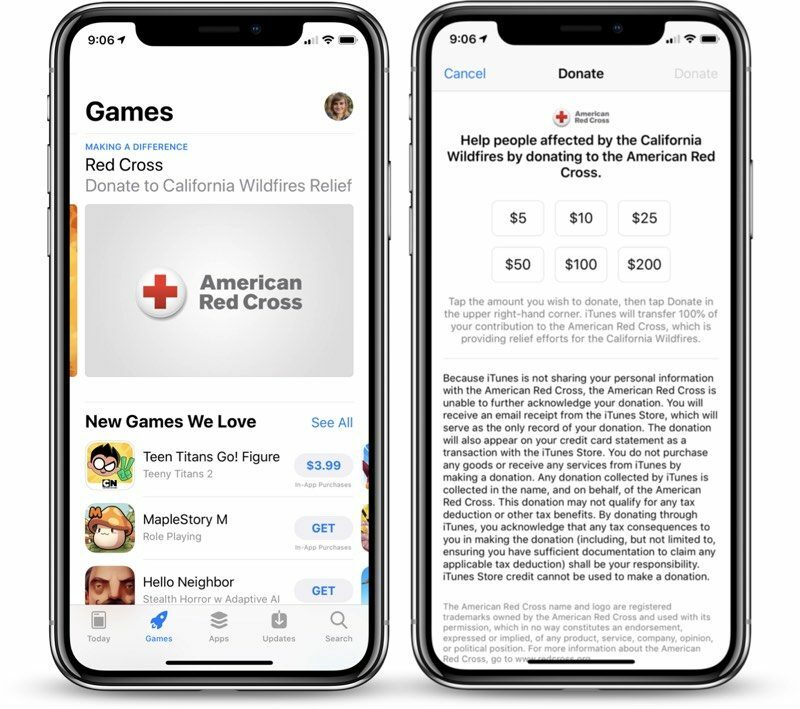 Can MacRumors stop blindly posting the iTunes Red Cross information each time there’s a disaster and include at least a brief note recognizing there are other alternatives for people who want to help? Whenever Apple does the Red Cross PR thing, a large number of the comments (correctly) focus on the fact that the Red Cross gives comparatively little to actual disaster relief compared to other charities, including local ones who often know better where the money is needed. No MacRumors isn’t required to help, and neither is Apple. But it would be nice to do the right thing so that the people whose lives are affected can get the help they need. If there is a foundation that I'm going to be donating money to, you can bet the Red Cross are at the very bottom of the list! Salvation Army does WAY better than the Red Cross. The Red Cross is more of a business than a charity. Because even on fire, anywhere in California is better than the rest of America. First, you are wrong about this area being "one of the hottest, driest areas in the country". Those would be the vast desert areas of the Southwest. Obviously since tree grow to hundreds of feet these areas are not dry except in periods of drought, which occurred from 2012-2016. My relatives that were burn out in last fall's fires in Napa county were victims of this. From their home you could barely see the mountains. They lived on a typical suburban housing track where hundreds of homes and a few neighbors were consumed. Third, almost all of us live somewhere with natural hazards. The worse loss of life in natural disasters occurs due to water. Be that from flood like in the Virginia's recently, hurricanes (Katrina, Sandy, etc). And most people live within 75 miles of the coast or a major body of water. Fourth, even in areas not near mountains or water there are hazards. The Mississippi and other major rivers flood. The strongest earthquake in the US occurred along the New Madrid fault that threatens Illinois ('https://en.wikipedia.org/wiki/Illinois'), Indiana ('https://en.wikipedia.org/wiki/Indiana'), Missouri ('https://en.wikipedia.org/wiki/Missouri'), Arkansas ('https://en.wikipedia.org/wiki/Arkansas'), Kentucky ('https://en.wikipedia.org/wiki/Kentucky'), Tennessee ('https://en.wikipedia.org/wiki/Tennessee'), Oklahoma ('https://en.wikipedia.org/wiki/Oklahoma') and Mississippi ('https://en.wikipedia.org/wiki/Mississippi'). It was strong enough to ring church bells in Boston and temporarily reverse the flow of the Mississippi. And of course there the man-made earthquakes caused by fracking in Oklahoma and Texas where unfortunately people do not have earthquake insurance and build basements. So the bottom line is there are hazards everywhere. And when the disaster strikes the best one can do is pick yourself up and keep moving forward. And the best those of us not effected by the tragedy can do is try to find ways, like contributing money, to help those effected. Because we all know one day the roles could be reversed. In ALL the CA fires I've lived through, I have never once ever seen a Red Cross anything, anywhere. What is the point of this??? Maybe you did not notice, but Red Cross usually has a large presence at fires like this. Here is some local reporting about their involvement in the Redding area. The Red Cross keeps 70% of donations for "administration costs". There's never been a disaster where the involvement of the Red Cross actually made a significant difference. These two sites are reporting the Red Cross is spending about 11% on costs/overhead. I know it is popular to dump on the Red Cross, but I have personal experience with them at local disasters and they really do provide a valuable service.